March is officially endometriosis awareness month and that means it’s time for me to get writing. Endometriosis awareness has come on in leaps and bounds since I started this blog way back in the dim and distant past of 2009 and even more so from the time before that. This has led to some noticeable real world differences. For me, I’ve noticed that when I talk about my research interests there are a lot more people who know about endo, or have at least heard of it; I certainly don’t get as many blank stares as I used to. However, endometriosis still doesn’t receive the attention that it deserves from governments and policy makers, so I salute those brave souls battling to raise awareness of this disease. Endometriosis is far from rare, however there are rare ways in which endometriosis can present itself. This week’s post is dedicated to those rare forms of endo, found in unexpected places, to create an ‘endometriosis atlas’ of sorts. Anyone who is familiar with endometriosis will know that it is usually found on or around the pelvic reproductive organs, such as the uterus, ovaries, fallopian tubes and the surrounding ligaments and structures. What is less well known is that endometriosis has been found in almost every part of the human body, although finding endo outside the ‘normal’ locations is rare to extremely rare depending on the location. 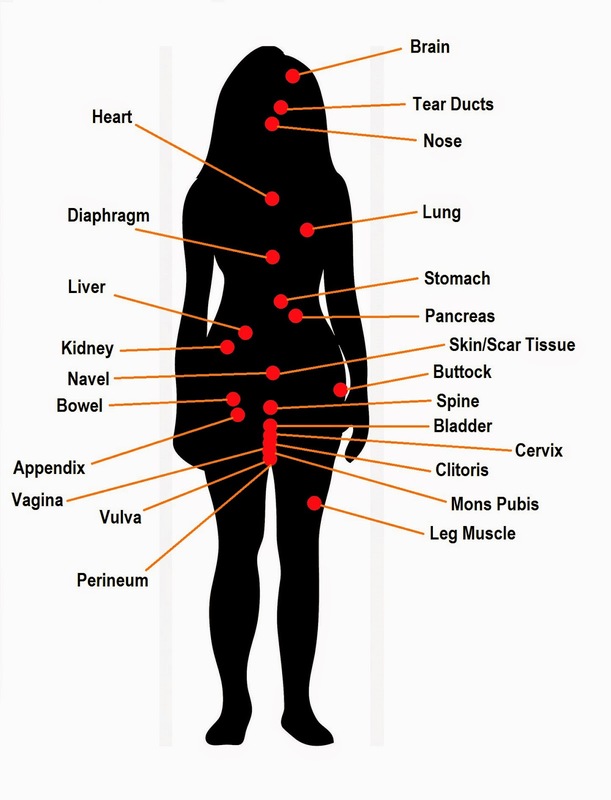 I’ve scoured through the literature and come up with the diagram below showing all the places endo has been found in the body. As I mentioned before, many of these incidences of endo are rare, some of the cases (like endo in the heart/brain/nose) have only ever been reported once or twice, so whilst they are not impossible, they are very unlikely. In a lot of these cases patients report cyclical symptoms, like pain or bleeding around the time of menses, which is really the only clue physicians have that endo may be the culprit. Equally, or perhaps more unusual than the odd locations of endometriosis in women, is the occurrence of endometriosis and endomyometriosis (a uterus like mass containing uterine muscle and endometrium) in men. There have only ever been around a dozen cases of male endometriosis reported, so it is an extremely rare phenomenon. Below is a diagram, similar to the one above showing, the locations of male endometriosis and endomyometriosis. Interestingly, the majority of these cases have been in men undergoing hormone therapy for prostate cancer, or men with a condition or medication that would alter their normal hormonal balance. One of the more plausible explanations for male endometriosis is that, during the very early stages of development, small pieces of embryonic female reproductive system precursors remain and can become ‘activated’ when exposed to external hormonal influences (I’ve given a better explanation of this previously). Maybe this could give us some insight into how endometriosis in women develops? Here are the sources for each of the case reports where endo was found. It is probably isn’t a comprehensive list as there are multiple reports for each incidence, but I’ve only chosen one as a representative example.